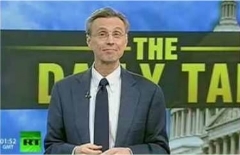 Thom Hartmann is a rarity among liberal radio hosts. Not only does he frequently invite conservative guests on his show, and engage them in debate that is often contentious but rarely unpleasant, he did something this week that many liberals are ideologically incapable of doing. SMERCONISH (crosstalk): ... an awareness of the danger that that possesses. HARTMANN: I mean, they don't have the choice. You've got, you know, Clear Channel owns about half the major sticks (stations) in the United States and about half the minor sticks and they own Limbaugh's show, Hannity's show, Beck's show and just pay these guys a salary. So they're making all the money from their own programming. Sirius XM is moving to that model. Cumulus, you know, has just recently become the major competitor for Clear Channel. Cumulus controls, you know, they bought Westwood One, so they bought our show and all the other, you know, they don't own this show, I independently own it but, you know, some of them are. And they distribute it and we're not on a single Cumulus station and which makes me scratch my head and wonder about the future. And it's, but they're developing, I mean, they just hired Mike Rogers (R-Mich.) out of Congress, right-wing, you know, Republican conservative to come up with a new kind of, you know, they're developing their own lineup to go up against Premiere (Radio Networks) on the right. And I think that there's some truth to what Limbaugh used to say and that is that on the left, there's just as much demand for intelligent conversation about the issues, but on the left it's largely satisfied by NPR. And so on the right they come up with this, this reactionary stuff as a counterbalance to it. Could it not be that my biggest, you know, problem and competitor is actually NPR? It's one thing for Limbaugh to point out that liberal talk radio is essentially indistinguishable from the precious offerings on National Public Radio -- here you have one of the top-rated liberal talkers in the country acknowledging it. Limbaugh's observation, and Hartmann's acquiescence that it is truthful, makes sense when one considers the reach of NPR's radio audience. In its most recent annual State of the News Media report, the Pew Research Center last year found that only two radio formats hit double-digit percentages in audience share -- country and "new country" at 14.1 percent and "news/talk/info+talk/personality" at 12.1 percent. "According to Pew's report, 26 million Americans listen to NPR each week, not counting its growing online and mobile audience," wrote Peter Weber at The Week back in February. "The other big segment of the news/talk universe is, of course, talk radio, where Rush Limbaugh is still king, drawing 14.75 million viewers (presumably Weber meant "listeners") each week. ... When people listen to the radio, what they're most likely listening to is country music, NPR, or Rush Limbaugh." Liberals complain about conservative dominance of radio, but rarely acknowledge NPR balancing the scales. What galls conservatives is that NPR does this while rarely admitting its liberal bias -- and relying on government subsidy to fund its operations. "National Public Radio is properly understood, even by the media, as radio by and for liberals, not the general public," Media Research Center president Brent Bozell wrote at Townhall.com in 2003. "As Washington Post media critic Howard Kurtz puts it, the media landscape stretches 'from those who cheer Fox to those who swear by NPR.' "